Change positions regularly to give your muscles the rest needed to support you better when you return. If you’re sitting, stand up. If you’re bending over, stand and arch backward. A 60 second break every 20 minutes is ideal .Walk 30-minutes briskly on a flat surface. It’s important to keep your body’s circulation working well. This helps to increase healing. If pain arises take breaks as needed. 1.) 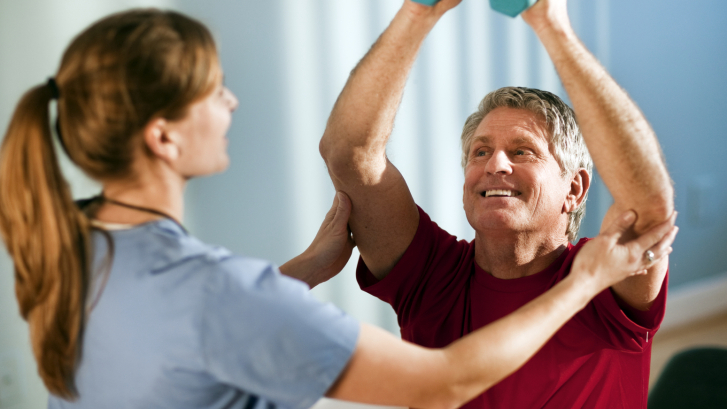 Beware of physical therapy offices that provide only a passive type of therapy. Such as using only hot/cold pack, massage, electrical stimulation and ultrasound. These treatments may feel good for a very short period afterwards, but they are not a cure to your problem. 2.) Beware of physical therapist who does not teach you something new for your problem each appointment. Whether it be a new exercise or self-help tip. 1 ) Do not sit for prolonged periods. Even if the your seat is supportive, postural muscles fatigue after about 20 minutes and you will begin to slouch causing more stress to the back. A simple rule would be to stand for one minute after 20 minutes of sitting. 2 ) Do not hold your breath. When you’re in pain it is a natural tendency to hold your breath. It’s your body’s way of “splinting” itself. It is also a compensation your body makes to stabilize itself if the core muscles are weak. However, when you hold your breath, it increases pressure in the abdominal cavity, and pressure on the spinal discs. 3 ) Do not lift. No matter the source of the injury, lifting causes compression to the spine. Depending on the severity of the injury, even as little as 5 pounds can cause increased pain. 4 ) …do not lift away from your body. Simple physics tells us the longer the lever (the further away the load is from the body) the more torque is generated. Keep everything close to your body. 5 ) Do not twist, particularly if carrying something. Rotational forces can be the most damaging to the spine, as it places the disc in its most vulnerable position. 6 ) Ice. Especially if it’s the first 48-72 hours after the pain started. This will help with the acute inflammation, and will dull the pain. Even as little as 10 minutes will help. If you are using a gel pack you can lie on it through 1-2 layers of t-shirt with your legs elevated. If you’re using an ice bag you may require additional layers to protect your skin, and it should be placed on your back as you lie on your stomach. If you are uncomfortable on your stomach, try lying with a pillow under your belly button. 7 ) Heat. You can begin to heat after the acute (48-72 hour) period has passed. This can help alleviate tight, stiff muscles, and improve circulation to the area. A hot shower is a good way to apply heat, or with a heating pad in the positions described with ice. If you are lying on the heating pad you may need an additional layer between you and the heat source to prevent a burn. The best time for heat is when you wake, or before activity. Heating should be about 10 minutes as well. Prolonged heating of 15-20 minutes can aggravate your pain, so monitor your time and intensity of heat. 8 ) Topical analgesic products. Balms, creams, gels, oils, lotions, patches, ointments can be found in every pharmacy without a prescription. Understand they will not cure your problem, but they can be effective in reducing the intensity of the pain. 9 ) Take frequent breaks. If you have a lot to do that will require being in a prolonged position, or repetitive movement, break it up. If your typical yard work takes an hour, 4 15 minute jobs spaced throughout the day may save you some pain. 10 ) Hydrate. The cells require water to carry out their basic tasks, and when there is an injury there is cellular waste and inflammation that must be removed. Hydrating aids this process. Also, the disc (the cushion between the vertebrae of the spine) absorbs water, particularly when we are lying down. So drink up, it can help your back pain. We all generally accept that we will all have to face pain in our lives at some time or another. We twist an ankle, maybe lift something we shouldn’t have, miss a step or trip and fall and there it is. Pain. And if you are generally healthy or younger you bounce back and heal quickly. However, if your injury is more severe, or your pain came from no particular injury or event, what do you do? Many go to the medicine cabinet for an anti-inflammatory (NSAID like Motrin, Advil or Aleve) or other pain relievers like Acetaminophen (Tylenol). And after 30 minutes to an hour later the symptoms are better…for 4 to 12 hours. Then the next dose is due. Usually a few days to a few weeks of this, and you get better. For those who don’t, can we continue these medicines indefinitely without some cost? We have heard many times that pain is a “sign that something is wrong”, and by taking medication we are merely ‘masking’ the pain. That bit of fool’s gold is marketed beautifully by the actor portraying someone with knee pain playing basketball only because of their particular brand of over the counter remedy. So, since we are feeling better, we should resume our normal activity, right? I’ll tell you that if you have pain with no particular injury, nearly 80% of these conditions are related to muscle imbalances, and those that had a specific injury have a muscle imbalance that impairs your ability to heal that injury. The problem of taking the medications (masking the pain) is that you never addressed the underlying cause of the pain, or at least a major contributing factor in healing from the injury, the muscle imbalance. The other factor to consider is that if we are masking our body’s warning that something is wrong, we could potentially be causing ourselves more issues by putting excessive stress on the tissues that are involved in the problem. Let me give you a simple analogy. Think of your body as a car. This car has several gauges that let you know about the performance of the car. Let’s say the ‘check engine’ light is on indicating there is problem. Most people who don’t know much about cars consult a mechanic to take care of the problem. But let’s say that light is on, and it’s bugging you, and your simple fix is a black piece of electrical tape. The car still seems to run fine. You don’t see that warning anymore, but slowly there is more wear on the car, wear that could have been prevented. That to me is how I see the chronic use of these over the counter medications. However, this is far from the worst issue to concern yourself with the use of these medications. A more holistic approach to these pain issues is needed, and likely the most effective. To have an expert identify, and correct muscle imbalances, and advise in any lifestyle changes can speed the body’s own natural healing powers. Powerful, state of the art technology, like LASER to eliminate pain, reduce inflammation, and speed tissue healing is available, and physical therapists are the professionals that can do it. Put the medication down and pick up the phone. Make sure that there are working smoke detectors on every floor. Find a phone with large number pads and large speed-dial keys that can be programmed with important numbers. Post emergency phone numbers in large print on or near the telephone. Supply telephone with direct dialing system for emergency/important numbers. Hide house key outside or give to neighbor for emergencies. Put automatic door closing devices on doors to outside and alarms when needed. Notify local police department that if your family member is memory impaired. Be certain that there is adequate lighting throughout the house and install nightlights. Check that all electrical cords are free of frays. Put childproof plugs in outlets. Be certain that no outlets or switches are unusually warm or hot to touch. Reduce clutter; Remove furniture that is hazardous and may move when leaned on. Put reflector tape on furniture corners, hallways, bedrooms to create a path to follow at night. Avoid polished floors that may be slippery and remove all non skid resistant rugs and runners. Remove or lock up sharp objects/breakable ones and remove all firearms from home. Keep electric fans out of reach. Cover radiators with radiator guards. Supervise or restrict smoking, use safety ashtrays and keep matches/lighters out of reach. Use flame-retardant mattresses, pillows, and sheets and plan procedure for fire evacuation. Store all prescription and over the counter medications safely away and clearly labeled. Lock up cleaning supplies, chemicals and poisons and install a carbon monoxide detector. Lock up valuables, important papers and documents and have system for safe mail retrieval. Be certain plumbing and utilities are working. Remove poisonous houseplants and have first aid kit easily accessible. Take away car keys when necessary and disarm/hide controls for automatic garage doors. Inform neighbors of any safety features in home that may restrict entry. Ensure walkway is uncluttered and doorway accessible. Provide safe entry into the house or apartment with secure railing present. Provide viewing of visitors prior to entry when possible. Secure doors to outside with double key locks, or high or low locks. Furnish with chairs/sofas that can safely get up/down. Adapt seating with additional firm cushions to raise seat. Provide auto raising lift chair to assist getting up when necessary. Be certain safe opening/closing of windows or key locked windows installed. Ascertain ability to operate the television and light switches. Keep cords out from under carpeting and furniture and clear of walkways. Maintain appliances in working order. Ascertain ability to manipulate sink faucets with hot water temperature settings reduced. Make sure electrical cords aren’t dangling near water. Ascertain ability to open/close refrigerator/freezer/stove door/ and cabinets. Ascertain ability to reach dishes, pots, utensils, and outlets. Store sharp objects are safely away. Keep flammables away from the stove area. Remove small non-food items that could be swallowed. Cover stove burners, remove knobs/shut-off valves/ and install auto-pilots when needed. Unplug or put away kitchen appliances not in use. Disconnect or camouflage garbage disposals. Locate bedroom near bathroom or furnish bedside commode. Use night-lights to provide nighttime orientation. Ensure safe transfer in/out bed and remove bed frame if bed is too high. Rent or purchase a hospital bed if needed. Supply bumpers or padding to surround bed if needed. Install reverse locks on doors when needed. Use monitor to listen to activity especially at night. Install room darkening blinds or shades when needed. Be certain that phone and light is accessible from bed. Be certain that clothes in the closet/dresser are reachable. Install grab rails in tub or shower. Provide a tub bench or tub chair for sitting in tub. Install hand held shower nozzle. Remove any scatter rugs and furnish bath mat and non-skid strips in tub. Replace glass shower doors with unbreakable plastic. Lock up razor blades, sharp objects, and store away electrical devices. Be certain that light switches, outlets and toilet paper are accessible. Widen treads or shorten risers. Replace outdoor stairs with ramps. Install sturdy handrail or grab rails along both sides of stairs. Put reflector tape on edge of treads. Install barriers or gates at stairs if needed.